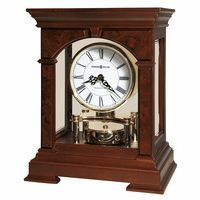 Beautiful styled Hermle tambour-style mantel clock in an elegant cherry finish. 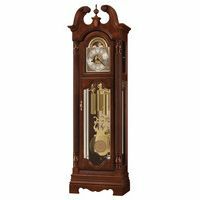 With brass feet, raised burl veneer panels and a beaded molding across the bottom. The dial features a diamond turned chapter ring with raised Arabic numerals and a beautiful embossed center. The hands are metal serpentine behind a brass bezel with convex glass lens. Brass 8-day key wound movement plays 4/4 Westminster chimes. 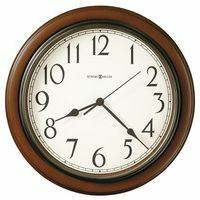 Also available in a classic oak finish 21130-i90340.